Help Vivian give customers the books they want! This was one of the first games I played and its probably the one I've spent the most time playing because of how difficult it is and because I wanted to finish it. At first I was trying to go for all the coins but then I reeled in my expectations to just finishing it lol. Maybe if I play again Ill take on that challenge. I love the art style and the level designs are really great. My only complaint is that some of the hit boxes seem a little off. Lots of moments where I felt like I shouldn't have died. The spacing of the checkpoints really helps relieve some of the frustration. I love how the skulls clutter up the game screen and seeing my stats at the end game screen. Overall I really enjoyed this one a lot! Thank you so much for participating! I am looking forward to seeing what else you do! I really love the art of this game! The game was pretty difficult especially the sea horse. I only ever got to 2. I think the thing that threw me off the most was the auto firing and my restricted movement, as an example sometime I had to move down to avoid projectiles but I would have to hit coral. Just thinking out loud. Thanks for your feedback and thanks for participating! Good job completing the jam! Love the subtle story behind the game and the different phases, it makes the game play a bit more interesting. The art, sound, and music is great too and I like that you used a Nokia case as the outline, adds authenticity! Thanks for your feedback and for participating! Love it. Got me laughing pretty hard. Good job running with the theme. Thanks for participating! Good job finishing the jam! The game looks pretty clean and the only bug I found during my play throughs was the dino would jump at the very start even when I didn't press the button. I would prefer the jump to be less sluggish but what can you ask for, the Nokia wasn't the most responsive thing in the world :). No shame in making a clone of the dinosaur game, its very charming. I hope you learned something in the time it took you to make it! My highest score was 1660. Thanks for the feedback and for participating! Good idea to spice up an old game a bit! So cool that you provided 3 modes of play. Controlling the ship was pretty difficult but as time went on I got a little better but it still didn't feel great Its still hard to navigate and shoot the asteroids. Overall seems pretty clean! Good job and thanks for making a game for the jam!! What an adorable game! I just wish it was scaled up so I could fully appreciate the cuteness. Great job with the art. The game itself seems super clean and polished. A more clear score/ life system is something I can think of wanting. I got some pretty unfortunate duck spawns as soon as the claw was hitting the water. I had a lot of fun over strategizing how to save my ducks from the death claws. Great job and thanks for participating! A polished tic tac toe game for the nokia 3310. Well done! Since I win every game "O" doesn't really know what its doing. I don't know how you programmed the O ai but a simple addition might be randomizing who goes first. Thats the only thing I can think of critiquing on this one. Its tic tac toe, an unbalanced game at its core lol. The sounds are nice and not too in your face. Thanks for the feedback and for participating! Great job completing the jam! I had a lot of fun playing I thought the difficulty was good. I beat the game on my second go. I liked how the camera zoomed in at each level. In some ways I felt like it made the game harder. Sometimes the jump and movement feels a bit sluggish and its really important for platforms to have precise and satisfying movement. Good job adding music as well! The tune definitely gets stuck in your head. I am glad to see that you're updating the game and refining it. I am excited to see where you take it! Thanks for being active in the discord and participating! I think this is pretty impressive for diving back in after a few years and in seven hours. I like the player sprite a lot and once it gets going its pretty fun to get into a rhythm. I made it to 400 something. Some of the hit boxes seem a little strange. I understand that Im supposed to shoot the enemy but I feel like I shouldn't lose if I try to jump over them and maybe just not get the points? I guess it makes it a bit of an extra challenge that you have to shoot the enemies. Thank you for the feedback that is one of the little things I overlooked that I would've been annoyed with as well haha. Thanks for playing and good luck getting back into developing! Cool idea! I thought the music, sound effects and all the provided options were great and fun to mess around with. My highscore was 9. There was a time I didn't get the game over screen and it kept going until I restarted although I wasn't able to reproduce it. Some of the blocks never fell and it was usually what cost me the game. Thank you for the feedback ill try my best for the next jam I host. Thanks for participating! I like the ascetics on this one. The movement felt really good its bit hard to see but it helps for accuracy if I was actually playing on my Nokia. My highscore was six! Some of the block configurations and my poor distance judging skills threw me for a loop. Thanks for making a game and for your feedback! Great job! I had fun figuring my way up and I liked the idea of the game. Life felt like it didn't matter at all to me so maybe 1 hit deaths would help plan around the enemies more. Cool control scheme and the tutorial was quick and easy, explaining everything well for the ascent. Thanks for your feedback and participating! There are a few GameBoy jams that pop up on itch (not hosted by me) that are pretty popular so keep an eye out! I loved this one and I wanted to keep playing until I beat it. I didn't manage my resources correctly the first time but I was motivated to come back and do it again! I felt like I had different gameplay styles I could come back and mess around with. Super great job on the pixel art. Thanks for your feedback. For the record I think you did a great job capturing what the Nokia sounded like. Thanks for joining! Not sure yet! This was really fun and there is a lot I think I could do better so I would love to host another. There are a lot of "retro" jams out there already so I don't want to congest the space with more. The 3310 idea came to me and I hadn't seen anything like it before so I made it. If I end up hosting another one I would love to see you enter! Fun little endless wave shooter. My highscore was 1500. I found that I only really died to the enemies who spawned almost on top of me. Props for including more difficulty options! Thank you for your feedback and for participating! Awesome idea! Built a whole ton of factories and then built apartment buildings until I got the win screen. The aesthetics are nice and there is a lot of potential. I could totally see something like this on the original nokia. Great job and thanks for participating! I liked how I didn't have to manage my jumps and only had to worry about x movement. It got to a point where it felt impossible to lose maybe add a little more risk or variety in hazards or platforms (spikes are a good go to). 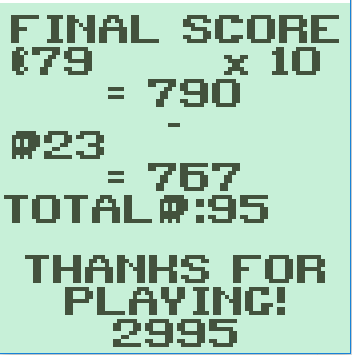 My score was 1720 when I decided to end it. Thanks for the game and for your feedback! Good job! Its super clean and polished. I almost went under $35 with a $3 bet every time (go big or go home). My biggest win was $75! Ended with $101. Thanks for participating in the jam! Fun little puzzler! I like the Nokia frame around the game and the option to see the gridded pixel screen option. I enjoyed the time I played it, alot of good "aha!" moments. Thanks for participating! Such a sick mechanic that I could see going further than the jam. It is a lot to keep track of but that can only be blamed on the restrictions. I think you did a great job with what you were working with and the sound design is sweet too. I am still a little confused what the grid point system means after you die. Thanks for participating! It was fun to see your progress on discord. As I said with Nokia Simulator I am a sucker for these simple self competitive games. They are fun and addictive. I don't know my highest score because I accidentally hit space again which restarted the game before I could look. A way to temporarily store high scores would be sweet. The highest I got to that I saw was 69. Thanks for participating and for the feedback! I am glad you enjoyed the jam. Goes by really fast so its easy to see all the different dialogue options which was fun! Some of the pictures made me lol because of how low the resolution is. Love how I would be playing this on my Nokia turned sideways too. Thanks for the game! Love the art style is reminds me of an old dos game I used to play. Love the idea of saving battery between rooms too. The character movement was a bit unpleasant and I felt like I had a lack of control over my character a lot of the time. The music was also a bit overwhelming sometimes. I "saved" -%60 battery at the end. Thanks for the entry! Good job finishing the jam! The environments were pretty cool, seeing what all the different environments could be made exploration more enticing. I made it a few levels. Super cool to have a gold and shopping system implemented along with everything. It seems like you managed your time well! Thanks for participating! Simple top down shooter. Good use of sound! I liked the carnage that built up around me as I killed enemies. I liked the font on the numbers as well. It was fun to build up a group of enemies and use my special to kill them all. Overall I feel like the game is pretty polished. Thanks for the entry! Absolutely love the art style! I think a negative and positive sound would've made this much easier to understand if I was playing it right. I thought I was shooting thugs but my left number (which I assume is my score based on the screenshot) always stayed at 0? I racked up misses really easily and I thought maybe my controls weren't even registering but I was able to start and restart the game. I was using SDF because I don't have a number pad. I like your post jam notes. Self reflection is always awesome. Thanks for submitting! Love this one! I had a few lol moments trying to control my ship and pick up the boxes. I thought the difficulty increase from the first to second level was pretty significant it took me awhile to get a hang on the movement going through the spikes. Great job with the soundtrack too! Thanks for participating! I like the concept a lot! I think you did a good job representing the character and setting a spooky mood with the darkness, importance of light, and all of the giant insects. I am still a bit confused what is actually happening when I am near the bugs/ how my light goes out and how to avoid it. Good job with the music too! Thanks for submitting a game! Im a little biased towards simple games where I can be competitive with myself but I loved your entry even though its an overused idea. The idea of a Nokia flying through brick walls is hilarious. The one tone beeping once it got going made me feel like a bomb was about to go off and added to the tension. I think having it on a bigger window would definitely help its play ability but something about playing on the real resolution is entertaining. I was wondering if the Nokia defaulting to the center lane made the game more difficult instead of leaving it where I last put it. I liked the defaulting to the center either way. My highscore was 890 but I really want to break 1,000 at some point. Thanks for the entry! This was one of the first ideas that popped into my head when I made this jam so I am glad someone made a virtual pet game! I really like the UI and the title page and the cat is super cute. At its core its a solid gameplay loop in terms of virtual pets. Maybe needs some more incentives although I was stressed out that I might mess up and potentially kill my cat lol. Thanks for participating! Nice job! As salamander said it was short but with more time Im sure you would've made more levels. I saw you were doing a reverse Downwell in the discord and I think it turned out! Downwell is one of my favorites so seeing it in reverse and imagining something like this on the Nokia 3310 is fun. Loved the shop. Thanks for participating! While I am not used to not pressing a button to fire I thought the way you approached it was clever. It was fun trying to balance dodging and thinking about where I was going to be firing. Movement was satisfying. I thought how far my bullets went and how close I had to be to enemies was a bit awkward because I felt like I had to be so close to enemies I never had an opportunity to react to enemy fire. This could just be because of how small the resolution is or maybe it would've made the game too easy. Thank you for making a game for the jam and for the feedback it means a lot! Sweet entry Machine! Love the interactions with the other bikers and the music. Super polished. Only thing I can think of would be an added score or reward for pushing the other bikers off the road or into the trucks (that was my favorite part). My best was a little over 5 KM but I want to come back and try and go further once I am done going through all the other entries. Im a fan of your other game jam entries so I was really excited to see you join mine. Thanks for participating! Wow. Just a super clean and crisp Snake clone. Really satisfying to look at and the only things I was going to write about were solved by checking out the options menu. Really great job I hope you learned a lot with this jam! My favorite way to play was snake speed fast without infinite walls. Thanks for participating!